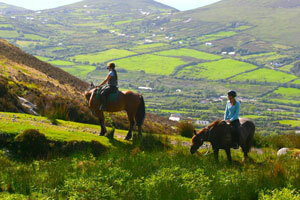 After lunch, we continued our trek up towards Windy Gap with Aoife of Killarnry Riding Stables. The spot where we were riding was the picturesque spot that a multitude of tour buses below were looking up at. Let me tell you, the best views are not from a tour bus looking AT the scenery. The best viewes were from where we were, up on the trails in the mountains. The ride up to Windy Gap got increasingly cold and, well, windy. It was good to be on horseback, as we headed up a steeper rocky incline. Once at the top, the views were breathtaking. We could look out to see verdant green fields cut by small stone fences, the bright blue waters of Dingle Bay, Dingle’s sandy beaches and green islands in the distance. The road that we were riding our horses on was an old mass road. Since there was only one Catholic church in the area, people would walk barefoot from the village of Glen Car, ten miles away, to get to mass. On horseback, it was a nice ride. but I couldn’t imagine doing it barefoot up the steep, rocky Windy Gap. 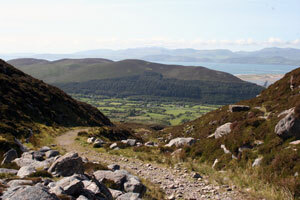 At the top, Aoife pointed out islands in the distance that were devastated by the potato famine. It was there, on the windy gap, that I began to have a new appreciation for the Irish people’s heartbreaking and triumphant history and their proud heritage. 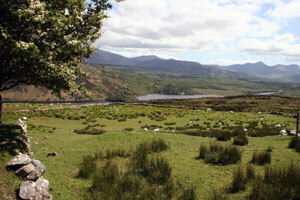 Amid the mountains and lakes of County Kerry, Aoife told us stories of local folklore. Her horse Alladin, led us down the Windy Gap. It was a magical end of the day.